Whilst Kinlochbervie is primarily known for being a busy fishing port, it is a small village set in the rugged, craggy Sutherland landscape. Loch and sea fishing can be arranged where haddock, hake, skate, sea and brown trout and salmon abound. 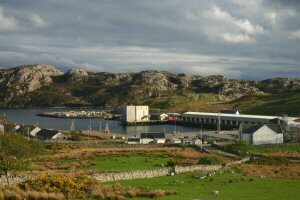 Kinlochbervie has become one of the major fishing ports in Scotland. Fishing boats, often based in east coast Scottish ports, land their catches here at the fish handling depot built in 1988. The fish is then transported in large refrigerated lorries to destinations across the UK and throughout Europe. The fact that many of the vessels are not based here tends to give Kinlochbervie a rather spartan, functional feel. The centre of life is very definitely the harbour and there is not a great deal more besides to attract the visitor to the village. Although the number of vessels has declined in recent years, the overall fleet is made up of a modern class of vessel which has diversified into new species caught in deeper water. There has also been an increase in the local shellfish creel fleet and the addition of state of the art vessels to this fishery has improved the landings. The main species caught by white fish trawlers are monkfish, haddock, cod, whiting and skate. The main shellfish fishery consists of lobsters, prawns, crabs and velvet crabs. Most days fish is landed at the pier and markets are usually held two or three times a week in the main auction hall which tourists can visit. The fish and shellfish are transported either to the east coast for processing or shipped directly to continental markets. Kinlochbervie harbour has itself in recent times diversified and there is now a thriving import trade from the Faroe Islands. Faroese trawlers bring in fish to the market and there is also the import of Faroese fish food for the salmon farming industry which is held in a custom made facility for onward distribution to fish farms throughout Scotland.